A bountiful harvest of organic fruits! We grow many beautiful organic fruits. In this picture, you can see a beautiful bunch of organic bananas, pineapple freshly picked, and papayas! Aside from two varieties of bananas, we grow: starfruit, mangoes, jackfruit, tangelos, limes, lemons, oranges, tangerines, papayas, avocados, liliquoi [passion fruit], macnuts, rollinias,sapote, soursop, dragon fruit, and others. Of course, not all of these are available at all times; there are growing 'seasons' even in Hawaii! At Anima Journey, we only use organic and vegan soil amendments to fertilize our fruits and vegetables. We use ag-grade spirulina, greensand, rock phosphate, other organic powders. We also use mulch to help with the water usage and keeping the weeds down. 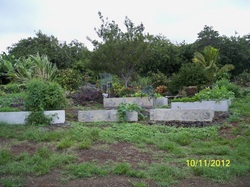 We have been putting in a couple concrete raised beds every few months in the last year and a half or so. We think the concrete has some advantages, such as: low maintenance, possibly keeps slugs from climbing up & into the vegetables, helps maintain slightly cooler temperature with the thick concrete [they are about 2 or so inches thick], and because they don't have 'bottoms', the soil is allowed to drain naturally. it also appears that worms and other helpful organisms can crawl or shimmy in from the ground, so we still get the beneficial benefits from being in contact with the earth. The downside is that they have to be watered every day, but that would be true of just about any garden. It’s VERY easy to grow your own sunflower sprouts! [Note: Sprout People differentiates between ‘sprouts’ and ‘greens’, which I’ve never seen before. In this article, when I write about ‘sprouts’, I’m referring to growing a sunflower sprout from seed which produces two leaves.] Sunflower sprouts are a wonderful addition to a healthy diet! They contain valuable vitamins and minerals, are easily stored, and can generally last up to a week in the refrigerator. I find growing sunflower sprouts even easier than growing other kinds of sprouts because with other kinds of sprouts [such as alfalfa, broccoli, buckwheat, etc. ], one has to rinse the sprouts at least twice a day, use a container with gradually differing sized lids [in order to allow the hulls to be rinsed out], and be careful not to let the developing sprouts get moldy or too dry. Additionally, I think sunflower sprouts have a richer, tastier flavor than the other kinds of sprouts. Raw foodists often like sunflower sprouts because they are a sprouted seed that is raw, and raw foods are often higher in enzymes than are cooked foods. Here are the items one needs to grow sunflower sprouts: raw sunflower seeds [my suggestion is to buy a small amount that you think will ‘work’ and test them out using the following steps; then you can buy more the next time; some seeds sprout while others don't], soil, a ‘flat’ [a container that is about 1 foot long and has sides about two-three inches tall], a sunny place to put the flat, and if birds are a problem [as they are for me – those Cardinals really like the seeds! ], then a wire mesh screen to cover the flat is helpful. 13. Put on salads and any other dishes you like [can even put them on steamed veggies just for something fresh and raw] and enjoy! 15. Start next batch of sunflower sprouts, beginning with step 1!